Cut to two years later in a small chamber where an al-Qaeda operative is strung up. We can make the connection, and Bigelow is fairly straightforward in her presentation. The operative is water-boarded, made to walk around like a dog, and stuffed in a small box, but there’s an almost clinical feel to the scene. It’s simply presented, and those who want to sympathize with either the victim or his captor will have little trouble. Bigelow doesn’t tell so much as show, and her aim is not to take a political stand; rather it’s to explain how the dots – 9/11, the London bombings, Guantanemo, Camp Chapman, the Islamabad Marriott bombing, and Osama bin Laden’s death – are connected. The guide is Maya (Jessica Chastain), a young woman who was recruited by the CIA right out of high school and is all but defined by the hunt. Her position lets us see every level of the manhunt, from the casual informants among the Pakistan streets up to the then-Director of the CIA Leon Panetta. Little is known about Maya, but throughout the film we gather that there’s not very much to her. She’s tenacious, almost to a fault, but she’s treated as a thread instead of analyzed herself. She follows leads that dead end, interrogates subjects, heads a surveillance team, and argues plenty with her superiors. Yes, her character develops and has an ultimate arc, but her strengths and weaknesses dually highlight the strengths and weaknesses of intel. When a lead is traced to what’s possibly bin Laden’s compound, for example, the surveillance reports cannot tell whether one of the inhabitants is male or female. There’s three females and two males accounted for so the sixth must be a male, as the women would live with either their parents or their husband; since there’s only six people, it must be her husband. But then they can’t be sure whether the sixth is bin Laden, and they can’t use cameras because they would be detected. It could be a drug dealer, but then their behavior is in line with other top al-Qaeda operatives. And why aren’t there any drug shipments going in? “We had a much stronger case for WMDs in Iraq” one of the CIA agents says. The work blends technology, high- and low-level informants, and logic, but it’s also a lot of luck. In short, Zero Dark Thirty shares a lot with Tinker, Tailor, Soldier, Spy. Both show the bureaucratic side of intelligence work and require a fair amount of attention from the viewer. But while Tinker, Tailor tipped more toward a character study of George Smiley, Zero Dark uses its characters as placeholders; that is, they exist not as the focus themselves but as strings that connect the web. 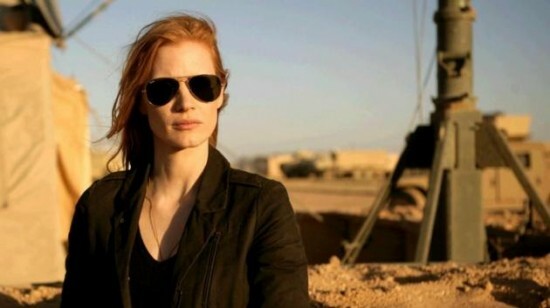 At the center is Maya, and though the character is interesting, I do think Chastain falls short of inspiring confidence, particularly near the end. Her casual use of expletives is intended to be erratic, but the delivery is awkward. Her voice is wavering when it should be commanding. This is a woman who’s spent a decade on the hunt and is finally at the end, yet shouldn’t she be less confused? That’s not to say Chastain isn’t fine the rest of the time, but there are some key missteps. Jason Clarke, Joel Edgerton, Mark Strong, Jennifer Ehle, and Christ Pratt, on the other hand, are given less difficult roles but make them memorable, and James Gandolfini as Leon Panetta is so compelling I wish we had more. Granted, I can’t attest to the accuracy, but I can sympathize with each one’s struggle, whether it’s one’s conduit of information being severed, another’s edginess knowing that a bomb could explode at any moment, or yet another’s concern that they’re marching into death and still not certain if the target is actually there. Her subject is a labyrinth, fortunately, Bigelow’s the baker.